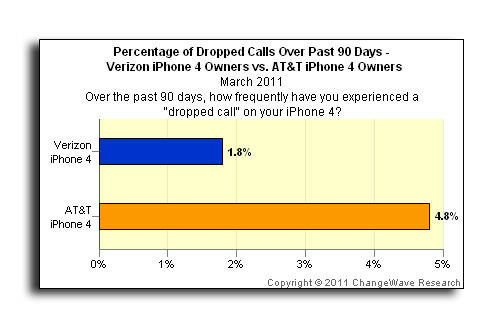 A survey conducted by ChangeWave of 4,068 iPhone users showed that over a 90 day period, 4.8% of AT&T iPhone users reported a dropped call while only 1.8% of those on Verizon's network suffered the same fate. The Apple iPhone is certainly not to blame here because a similar survey conducted using different handsets resulted in a 4.6% dropped call rate for AT&T and a 1.4% rate for Big Red. 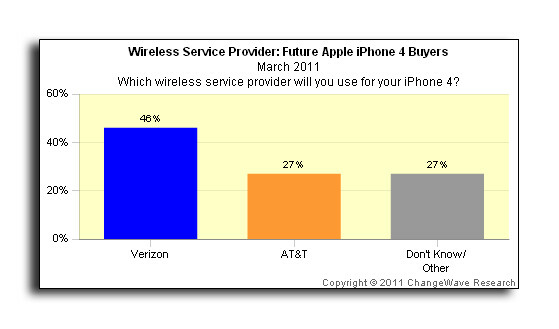 82% of Verizon's iPhone 4 users are very satisfied with the device with 16% somewhat satisfied. Over at AT&T, the figures are 80% and 18% respectively. ChangeWave also asked prospective Apple iPhone users which network they would sign up with. 46% chose Verizon, 27% picked AT&T and 27% were unsure or picked neither one. While the statistics appear to show a clear-cut advantage for Verizon's network, ChangeWave says it is still early in the game. They wrote, "Verizon is still in the very early stages of its iPhone 4 offering to consumers. It remains to be seen how well the Verizon network performs as the number of Verizon iPhone 4 owners ramps up and inevitably puts more pressure on their system." But until that happens, AT&T's iPhone customers have a higher chance of having a call drop in the middle of a conversation than Verizon customers do. No one cares about Verizon OR the Verizon iPhone. Shenanigans. Just because YOU don't care about something says nothing about other people's opinions. Man! Tell us something we dont know alright! fast Att iphone(HSPA) > slow Verizon Iphone(EVDO REV A) anytime, all the time. how's that 2GB cap working out for ya? Thats all about to change. 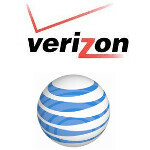 Verizons network will be miles ahead of att when Lte is finished in 2013. HAHAHAHAHAAHAHAH!!! It is easy to go over 2 gb. I don't have internet in my home (Not my choice, I live in the sticks) and yet, I run a web based business with my phone. On the 2GB plan. So I still don't understand how people plow through that much data. If you have wifi access at home its tough to even get close to 1GB of usage. Some people are just too attached to their phones and don't pay attention. I use wiring whenever possible cause its much faster anyway. For the last few weeks I haven't had internet access at home or work and that 2GB is easy to get to. So if you don't have other internet access the 2GB is a pain. The talk about capping DSL means to cap you after 150GB. If you use more than 150GB of data in a month, you deserve to be capped because durp it does slow down the network for everyone else. if they cant afford it those families shouldnt HAVE 5 smart phones. god knows little timmy needs to stay up to date on that the hot lunch is in his 4th grade class. Oh my gosh YES. Because they lower the plan to the 200MB plan and THAT you go over very easily. Any matriach/patriarch of a family with 5 iPhones on a shared Family Talk plan needs a good punch in the throat if they're going to constantly ask to lower their bill.